Where can I find the most colorful aspen in fall? Where are the wildflowers growing? These are just a few of the questions that many visitors, heck I would say that even Coloradans, ask during the different seasons here in Colorado. 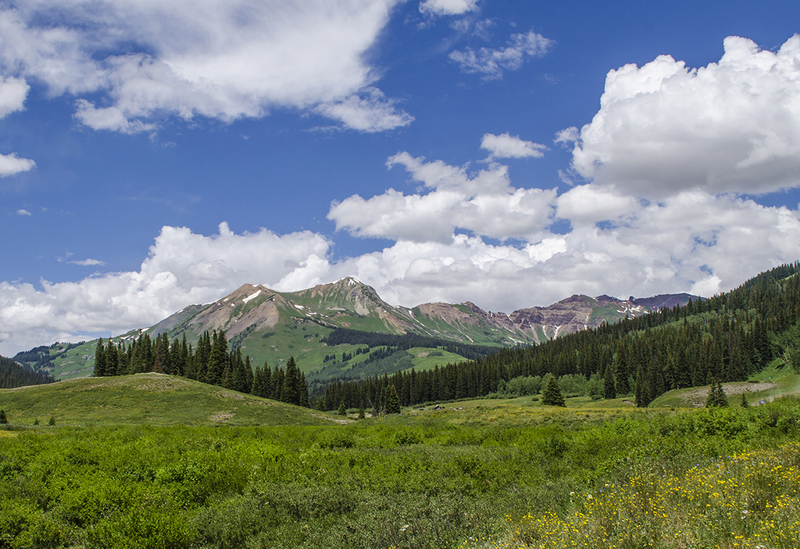 If you are looking for mountainsides covered in color in the middle of summer, then my answer would be…Crested Butte. 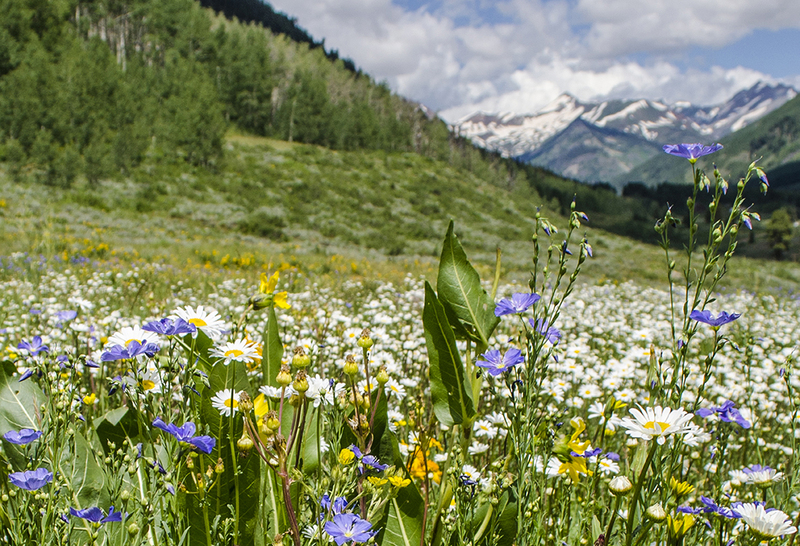 As a matter of fact, Crested Butte is considered the “wildflower capital of Colorado” and rightfully so. Every turn along every road and every path and trail in mid-summer is bound to take your breath away. 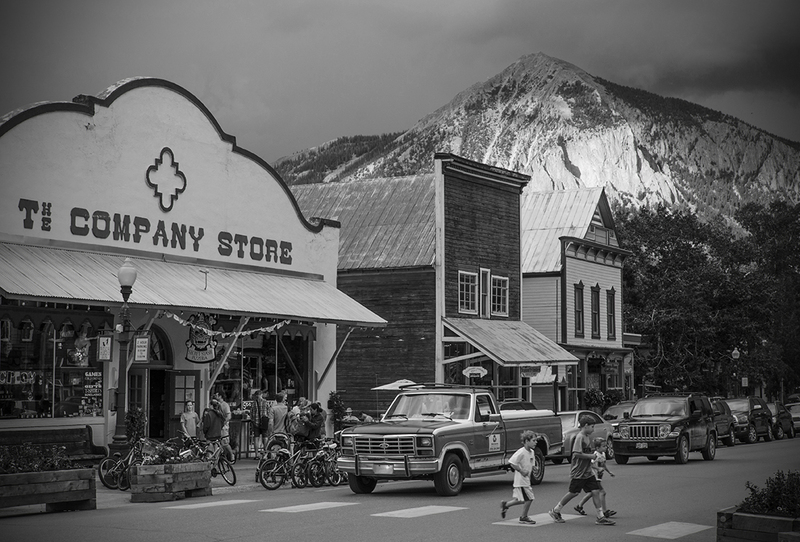 And, every summer, Crested Butte hosts the annual Wildflower Festival during the second week of July. Not that the wildflowers don’t bloom at any other time, but mid-July is peak season for a show of colors. I’ve been wanting to go to Crested Butte during the wildflower festival for several years now and this year, I finally did it. While my trip out was only for the day, I did my best to make it worth the four and half-hour drive from my place in Denver. The flowers, the town, the people and the weather did not disappoint. I took my daughter along this particular trip and we left before the sunrise. We made it to town in time for breakfast and after that, we were on our way to hunt for the best display. I quickly found out that no matter where we chose to go, we were not going to be disappointed. But, on advice from the nice folks at the visitor center, my daughter and I attempted to hike Woods Walk. This is an easy trail for low-landers and those who typically don’t get out to hike too often…ahem, my daughter. I wasn’t disappointed and despite my daughter’s tummy acting up (she headed back to the car while I wandered around the mountainside), I was treated to an amazing display of color and blooms. We took a little break here at Gothic and then continued along the road as far as I thought my little old two-wheel drive car could handle it. Scenery along Schofield Pass road. At one point, about a half-mile outside of town, a sign is posted that warns, “Only 4-wheel drive” can handle the road ahead. I kind of ignored this sign for about two more miles before I gave in and we headed back toward the Crested Butte area. Of course, not before I took a few more shots of the amazing scenery of the area. Oh and by the way, this road continues over Schofield Pass and then on to the town of Marble on the other side of the mountain range. One section along this road is affectionately named, “The Devil’s Punchbowl.” Go ahead, look it up! My suggestion would be to search for videos on YouTube. 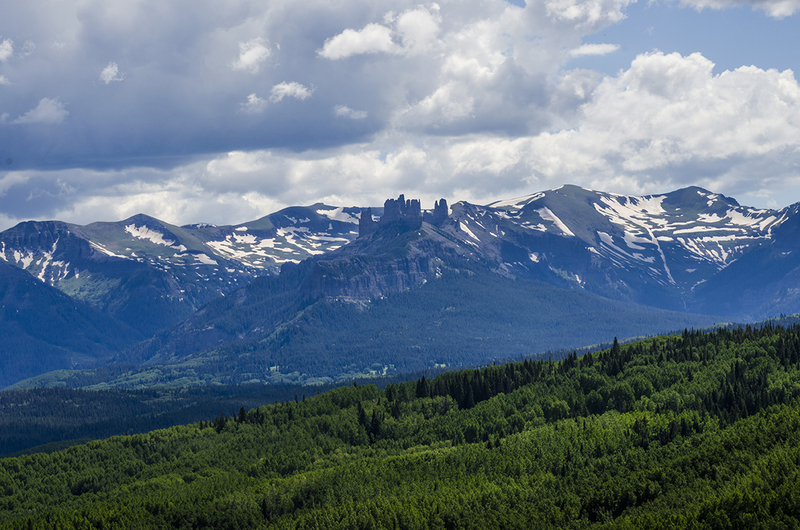 The next curiosity I wanted to satisfy had to do with the Castles along Ohio Pass road. Of course, I found many images of the Castles on the Internet, but I had to see it for myself. So, off we went over another dirt road. This time though, the dirt road is a little tamer as compared to Schofield Pass road. To get there, I took Hwy12, otherwise known as Kebler Pass road to the junction with Ohio Pass road. This junction comes about 100 yards east of Kebler Pass. 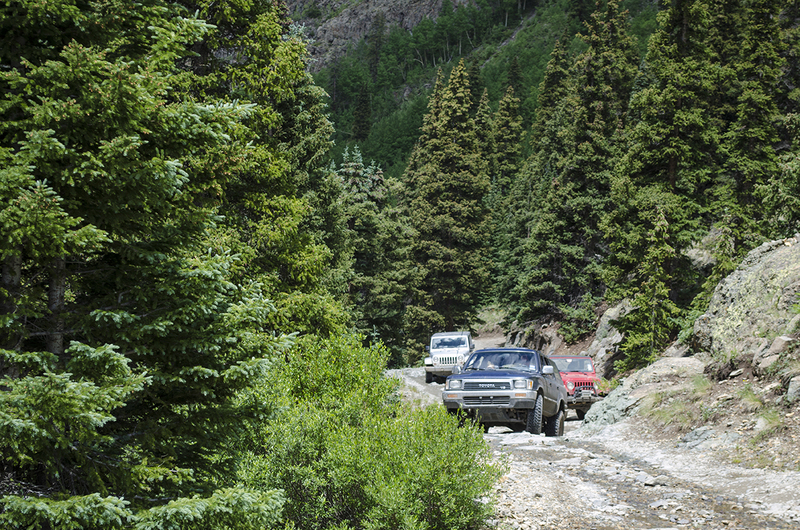 The road is actually a forest road, so it isn’t as well maintained as Kebler Pass road, but still drivable in my little old car. Not too far after the junction, you come out of the pine trees and to an area of road which is not quite wide enough for two-way travel. The road has a sharp drop-off, but the views are spectacular. After a few miles of driving downward through an extremely old stand of very tall aspen, we came to a very open valley, green with grass and dotted with several ranches. I found the wildflowers a little harder to get to along this road, since many of them were up steep hillsides. The road continues on from here for another 20 miles until it reaches Hwy50. Since I had other things on my mind, I turned around and headed back toward Hwy12. This road is 32 miles long and connects Crested Butte to Hwy133 and Paonia on the southern end and Carbondale to the north. The road itself takes you through what may be the oldest stand of aspen in America (just hasn’t been proven yet). The aspen are tall and straight, and the feeling you get while driving through them is that of serenity and peace. Of course, that is if you aren’t zipping through as if on your way to an important meeting. 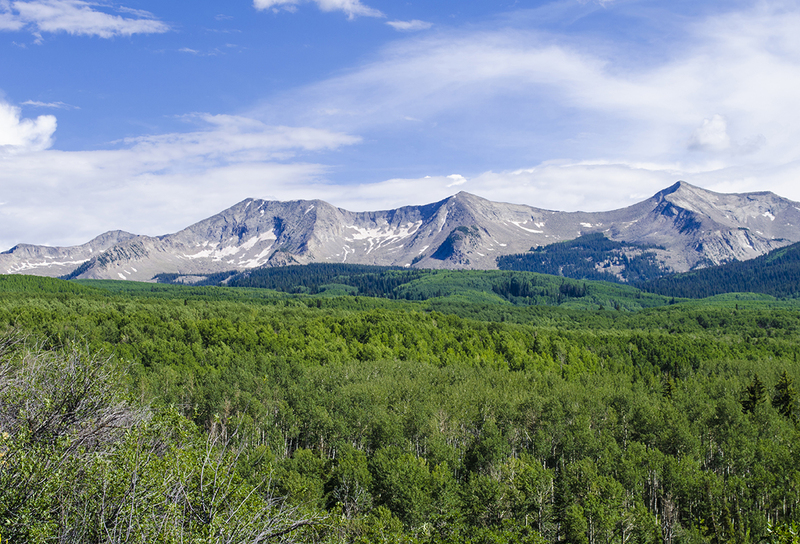 When you come out of the aspen on the northwestern side, you get an amazing view of the Anthracite Range. Anthracite Range along Kebler Pass road. Along this route, it’s best to hike one of the many trails (Lost Lakes, Lake Irwin, Anthracite, and more) to get a better view of wildflowers. While the aspen are amazing along the road, the plants that cover the floor (under the aspen) are mostly fern with a sparse few lupine scattered throughout for good measure. I know that I could have found plenty of wildflowers had I had the time for another hike. After the Anthracite Range, I turned around and headed my humble little car back in the direction of Crested Butte for dinner before hitting the road for a four and a half-hour drive. My daughter and I stopped in at The Last Steep and enjoyed massive sandwiches….I had the jerk chicken and she had a “basic” burger. When all was said and done…I decided that most definitely, I will return with a mission. Whether that mission will be to capture the rapture of fall, or to seek out new wildflower hidden treasures, some of the beauty is in the planning, or lack there-of as the case may be. Crossing fingers that part of the next excursion includes a few nights local stay. 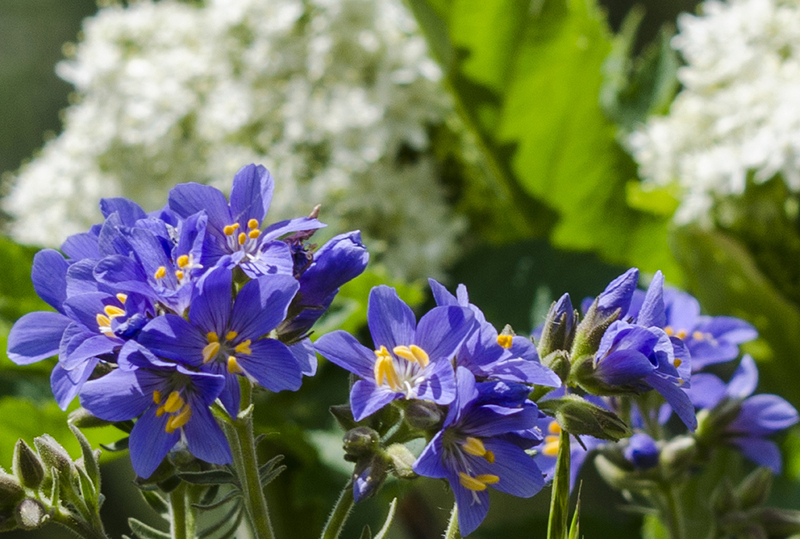 Check out Colorado Wildflowers website for more info on the many different wildflower species in Colorado. Near the stables at Mt. Crested Butte. Riding in Mt. Crested Butte. 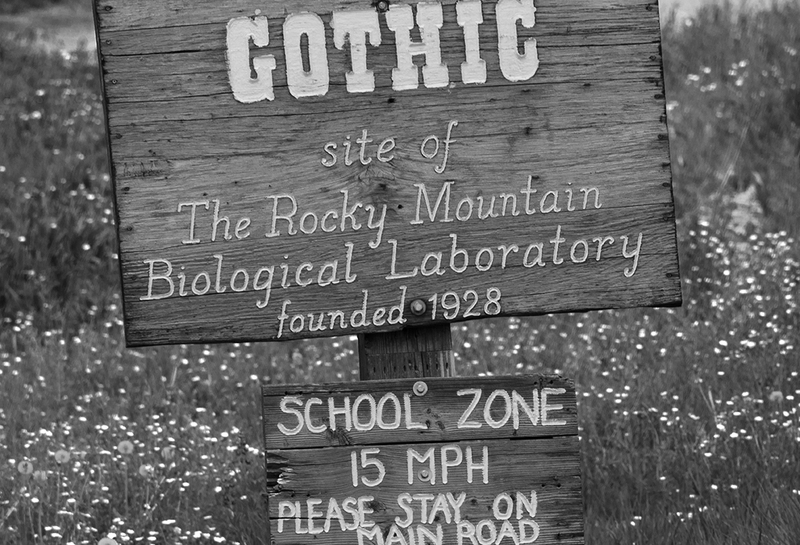 Town of Gothic and site of RMBL. Thanks Brenda! It sure was fun.